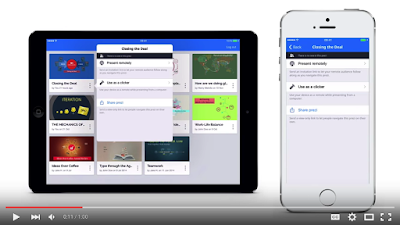 There are different ways to remotely control your presentations through iPad. For instance you can use one of the wireless mirroring apps to display your iPad screen on a projector while playing your presentation on the connected iPad. There are also two other reliable apps that allow you to use your iPad or iPhone as a presentation remote or clicker. These are Prezi (clicker) and keynote Remote. Keynote Remote allows you to control your presentations from any iOS-enabled device. You can open your presentation on Mac and use your iOS device to remotely control it. Alternatively, you can link your mobile remote device to another iPhone or iPad. To use Keynote Remote, you need to link your remote device to your Mac or other iOS enabled devices. To do this you have to make sure both devices have the latest versions of Keynote. Below are Apple’s instructions on how to link Keynote Remote to your Mac. To learn more about how to connect Keynote Remote to other iOS devices, check out this page. "Make sure that Wi-Fi is turned on both on your Mac and your iOS device. Tap the Keynote Remote icon in the toolbar of the presentation manager. If you're in a presentation, tap Presentations in the toolbar to open the presentation manager. In portrait orientations on smaller devices, tap the icon. If this is your first attempt to link to this Keynote Remote, tap Continue. If this is not your first attempt to link to this Keynote Remote, tap the Devices button. Then tap "Add a Device." On your Mac, click the Link button next to the name of your iOS device. It should appear in the Remotes menu. Older iOS devices, older Mac computers, and older versions of Keynote require you to connect to the same Wi-Fi network. If you don't see your device, check your Wi-Fi settings to make sure both your Mac and your iPhone, iPad, or iPod touch are connected to the same network. Keynote Remote doesn't work over a network hosted by a Mac using Internet Sharing, or a network hosted by an iOS device using Personal Hotspot. Compare the four digit passcode that appears on your Mac to the passcode that appears on your iOS device. If they match, click Confirm. To control the slideshow on your computer from your iOS device, tap Play on the iOS device." Press has a wonderful feature called Clicker which allows you to use your iPhone or iPad as a presentation remote. This is a pro feature, users of the free version will not be able to access it. Watch the video below to learn more about how to use this feature or read this detailed visual guide for more information.